The best team all season in the world of college basketball has been the Kentucky Wildcats, who have only lost twice all season. 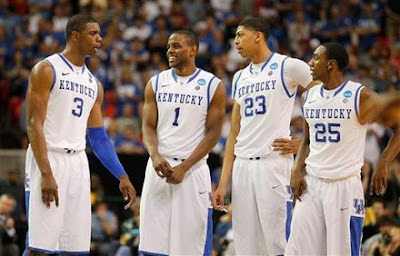 They are the overwhelming favorite going into the Final Four down in New Orleans and it must be asked, can anybody beat them? Simply put, the Wildcats do not have a weakness; they are loaded throughout their roster and they have plenty of star power. Anthony Davis is the best defensive player in college basketball in a long time and he has the athleticism of a guard, seemingly. Michael Kidd-Gilchrist is an elite defender who can get to the basket like a champ. Doron Lamb can light it up from the perimeter and when Terence Jones puts his mind to it, he can be a force in the paint alongside Davis. This team is stacked with the only supposed weakness being lack of experience, but there are key players on this club that have been in the tournament before, like Lamb, Jones and senior guard Darius Miller. They will be in for a relatively tough test in their national semifinal matchup with their rivals, the Louisville Cardinals. While Kentucky has a clear talent edge, and Louisville simply cannot score, anything can happen in a rivalry game and the Cardinals played them tough when they played on New Year's Eve. But ultimately the talent edge is too much to ignore and thus Kentucky should advance. In the championship game, Kentucky would then either face Kansas or Ohio State, two very talented teams but Kentucky still has the talent edge on both but it would be an exciting game regardless. But with the way the Wildcats have been playing this tournament, particularly once they turned on the jets today against Baylor, I simply have no reason to see them losing anytime soon.